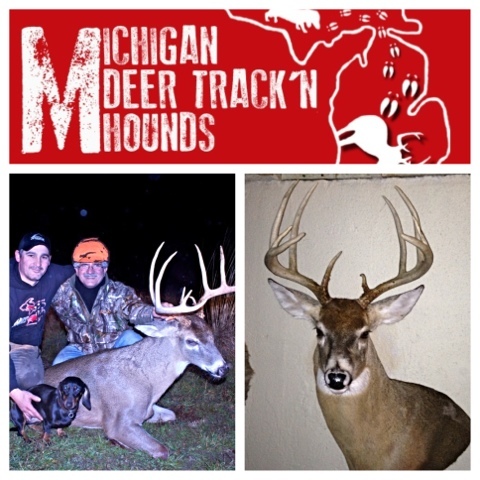 MICHIGAN DEER TRACK'N HOUNDS LLC Michigan's Professional Deer Blood Tracking Dog Services: The use of Deer tracking dogs in Michigan. 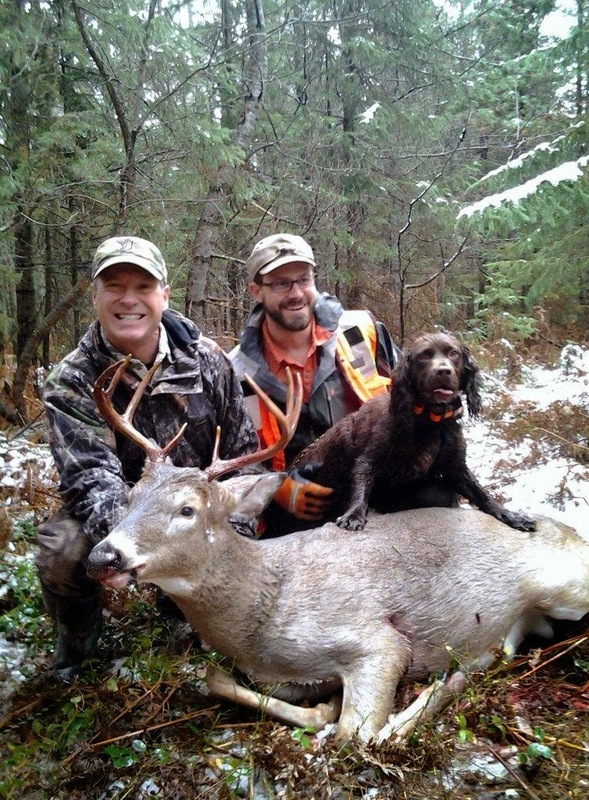 The use of Deer tracking dogs in Michigan. Muzzle loader or a crossbow they all have there advantages and disadvantages. 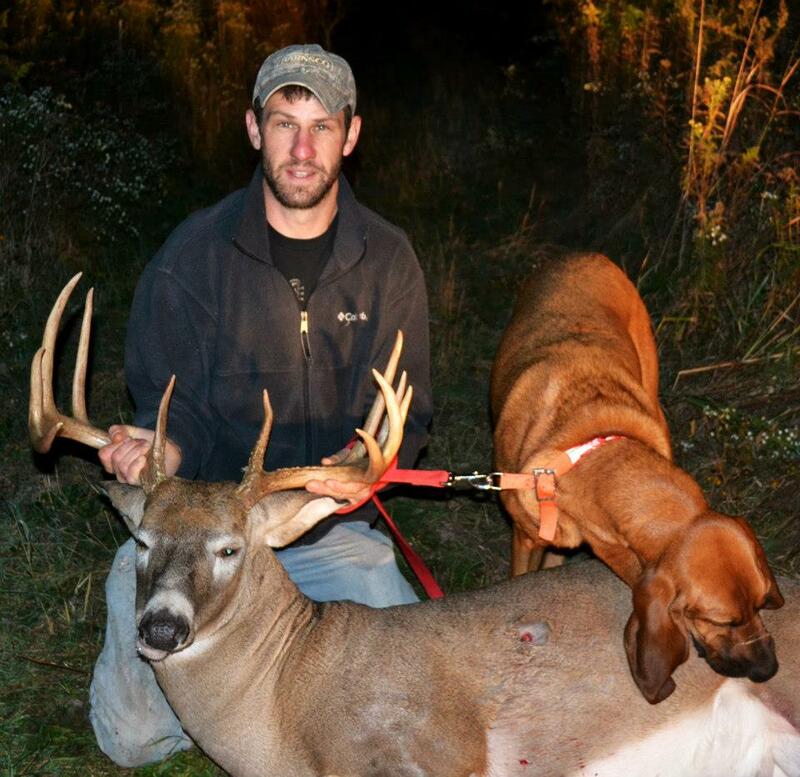 We all hunt for the meat and we really enjoy the challenges that a whitetail deer offers. It's very magical watching the early morning sunrise and seeing the first deer of the season. This list of reason why we hunt goes on an on!!! What about the moment of truth after you pull the trigger on your gun or bow and you realize your plan did not come completely together? The first thought that goes through your had is oh snap now what!!!!! Only a few months away will be the 2013/2014 deer season. Today's technology is simply mind blowing. The guns are tack drivers and today's compound/crossbows are deadlier than ever and we have broad heads that literally will field dress your deer all by them-self. We have blood tracking flashlights, blood enhancement spray, thermal imaging and we all have the one buddy that is by far the best deer/blood tracker out of the group. This buck featured in the picture was shot with a ML and after we tracked him we realized the shot was perfect and Sypris was truly not needed. Tracking dogs have been utilized for over 200 years around the world. There is no human than can track better than a trained tracking dog. There is no flashlight that can help you recovery your wounded deer better than a tracking dog. There is no blood enhancing spray that can help you like a trained tracking dog can. 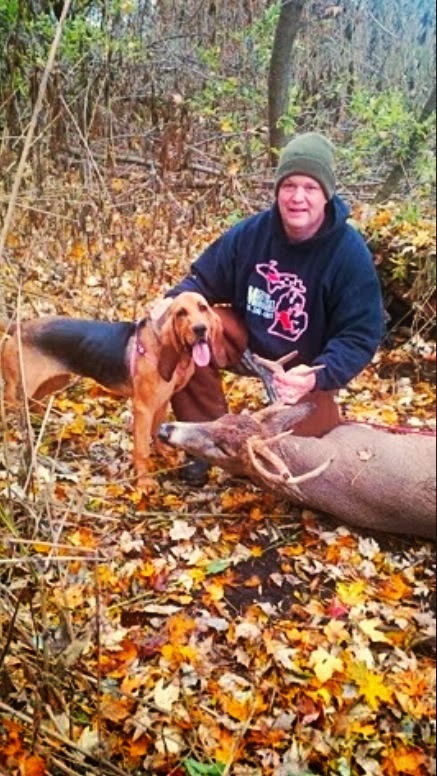 My point is this there is no shame in using the best tool available to Michigan hunters (tracking dogs). There are 7 MDTH trackers and over 20 more in our state. Some track for free, by donations,charge for there time. During this off season do your best to find a tracking team in your area and get to know them because you just never know when you may find your self at the end of a cold trail looking up and asking yourself now what. You owe it to the deer to exhaust all options to recovery it. I have read your post. Everything is looking good. It is real posting and i will share with you. You are truly to be commended. Your blog posts are very good about.